My family and home often get neglected when I’m preoccupied with quilting and planning new classes. I took a little break, slowed down, recharged, took it easy and enjoyed a well deserved holiday. I’ve been on holiday for 17 days and have spent it doing pretty much whatever I wanted. Usually I am trying to pack 48 hours of stuff into a 24 hour day – so being able to move at a snail’s pace has been seriously refreshing. This being a lady of leisure has worked out pretty well! I can get use to it…just missed my fabric and sewing machine. 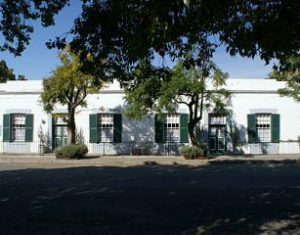 On route to our holiday destination we made an overnight stop at Graaff-Reinette in the Karoo. Greg, our host, welcomed us to experience the history, nature and beauty of this town. We stayed at Kambro Cottage – a single-storey, flat-roofed dwelling built in 1840. It is a National Monument and is an intrinsic part of the town’s history. What a pleasant surprise! 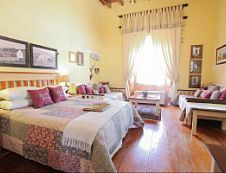 Quilts on the bed and throughout the room! 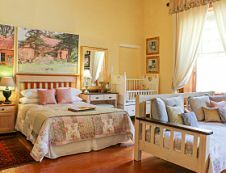 If ever you are in Graaf-Reinette, this is the place for any quilter to stay. You just need to put the fabric shutter onto the front door as was done way back when. 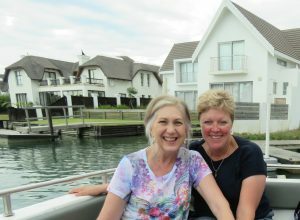 I also met up with my quilting buddy, Antoinette, for a 2 day visit in the picturesque village of St Francis bay. 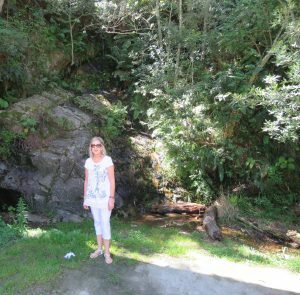 And then just to show you how beautiful South Africa really is – The old Montagu pass where the ferns are much taller than I am. And of course…I have a deadline to enter a quilt for the National Quilt Festival coming up later this year to haunt me and getting me started right away after I arrived home. Wish I could show you a sneak preview of it! I don’t know if it will be completed in time, but I am enjoying every minute of it. Girls this is the festival to attend. Book your classes early to avoid disappointment. See my teaching schedule and links provided for more information. It’s been 6 months since I had major surgery. After not allowed to quilt for 3 months I am my own self again. And after six months I can start teaching again and my diary is filling up. I am off to Pretoria tomorrow for the Moot Quilters’ Retreat and then 3 more festivals await me. I can’t tell you how grateful I am for having something to pour my thoughts and focus into. Quilting is that for me without a doubt! The illusion of time never ceases to amaze me. We might feel like we have a lot or maybe only a little. Last year has flown by and although it was an adventure I am not sure where it has gone. What I do know is that some exciting things are still to come during the next few months. According to Tula Pink “multi tasking makes you do stupid things.” For tried and true multi-taskers like me this is going to be a big task! I am so guilty of it! This will be a challenge. How am I going to do that…always spinning around the corners? Again I am so guilty doing on average 5 quilts at a time. Maybe just say no a few times instead of yes. That will give me more me-time. Don’t go from one teaching session directly onto another or immediately starting a new quilt project after just completing one. Let’s call it discipline. Set aside quilt time and stick to it. You’ll avoid dead lines. Designate certain time for certain things. It is important to focus on the things that really matter. Family is important. They need your time as well. Devote time to sitting down. Sit down, meditate or relax. It is needed for creativity and any way sitting is better than standing! The simple act of smiling eases the pain of life. Smiling at someone makes them feel good too. Move forward and don’t waste time thinking about the unsuccessful project. It is easy to fall into bad habits. I am going to try hard to focus on what is before me. De-clutter the mind, the space, the routine and be happy. Do a no-brainer between show quilts. Don’t we all need a time off? Obviously I am writing this to myself. For some reason it feels like more of a commitment when it is shared. This has become a metaphor for my life. Don’t give up, keep going to the end. What is the point of life if we don’t challenge ourselves from time to time? I hope you have a wonderful year filled with grand adventures.